Intense repair. Helps repair cracked heels from day 1. 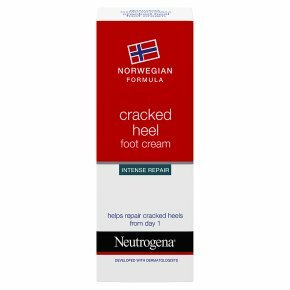 Developed with dermatologists.Properties: NEUTROGENA® cracked heel foot cream intensely moisturises and soothes dry, damaged and cracked feet. Developed with dermatologists, its unique formula combines: Panthenol, known for its powerful soothing action Glycerin, which help's restore skin's natural moisture. Visible results on damaged and cracked feet from the first use. Your skin is noticeably softer, smoother, and more comfortable. The nourishing texture is non-sticky and easily absorbed. Directions: Apply the cream at least twice a day on the cracked and damaged area of your feet.